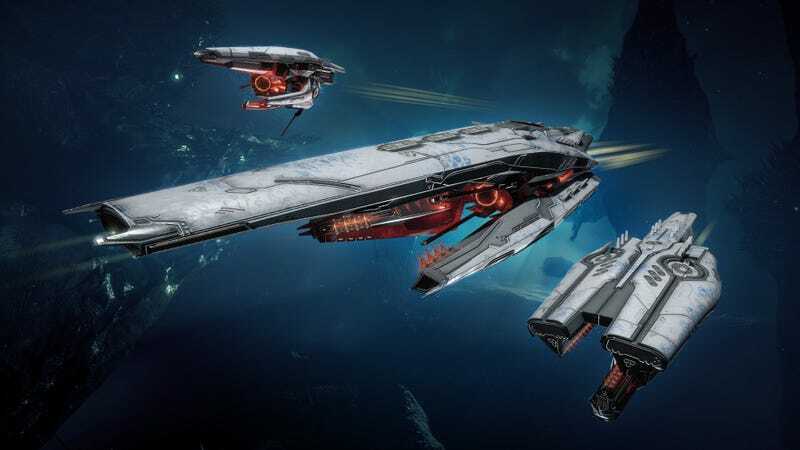 EVE Online’s new “Abyssal Deadspace” areas let players engage in true one-on-one combat for big rewards. Just pray you don’t run into BoRn2ReIgN. Abyssal Deadspace pockets, introduced in the latest EVE expansion Onslaught, are a new way for players to engage in high-stakes combat. At the end of the hazard-filled Abyssal Deadspace pockets, new stargates beckon players into Abyssal arenas. In the heart of these arenas, rare and valuable loot is held in a secure container. The only thing stopping a player from scooping it into their cargohold and making a clean escape is another player angling for the same target. Once players pass through these stargates, it’s kill or be killed. The introduction of this “instanced” style of PvP combat has been somewhat controversial in the EVE community. Many players feel that it goes against the spirit that the game has always upheld: EVE is a game of risk vs reward and is very much a sandbox game where anything can happen. Confining players into the dungeon-like areas of Abyssal space where nothing can interfere with their fights is seen as corrupting that sandbox-style gameplay. As you might imagine, BoRn2ReIgN does not share that opinion. “I have been loving it because it involves real risk,” he told Kotaku via Discord chat. Any form of “solo” pvp in normal space typically involves backup from friends should the fight not go well.” This is a not-uncommon complaint from players who enjoy 1v1 content in EVE: some players bring their friends, some players even bring their own alts, running multiple clients to support themselves in engagements where they start to lose. Due to the nature of Abyssal PvP, this is not a possibility. When a player commits to these arenas, they commit alone. Abyssal mods are items that are modified by the mutaplasmids found in the sites themselves. These allow a player to reroll the attributes on ship equipment, randomizing each stat positively and negatively. Getting perfect or near-perfect rolls on these modifications can create unique stat arrays that can be more powerful than any other items in the game. BoRn2ReIgN’s undefeated streak came to an end after his 29th straight victory, when he was bested by a member of his own alliance. (Apparently there are no friends in the Abyss.) He said that the value of his ship, a Vedmak-class Cruiser, was around 30 billion ISK, well above the cost of some of the game’s Supercarrier Capital Vessels. He was quick to rebuild, however, scoring his next Abyssal kill only two hours later. His winning streak, combined with the semi-stardom from CCP’s comments seem to have put a bit of a target on the Lord of the Abyss, whether in or out of the Abyss. While I was conducting our interview, BoRn2ReIgN stated that his ship was being engaged outside of the Abyss by players that had been lying in wait for him to return from Abyssal to regular space. BoRn2ReIgN had entered the Abyss through the game’s high security space, for added safety when entering and leaving, but his assailants used ships designed to do as much damage as possible before the in-game police force could destroy them. They prevailed, and he lost another Vedmak ship. Guess that’s just the price of fame.